It started as a loose collection of sky watchers, who braved the cold on countless nights to catch the shimmering colors of the aurora borealis dancing above them. It developed into a friendly argument between amateurs and experts, which erupted over beers one evening at a pub in Calgary, Canada. And it ended this week, with a peer-reviewed paper in a well-known scientific journal. That name is Steve. The discovery of Steve is described in a paper published Wednesday in Science Advances. It’s a scientific accomplishment that would make headlines even if amateurs had not taken part—or if it had received a less remarkable name. Scientists have not discovered a new aurora-related phenomenon since the early 1990s, said Lawrence Lyons, a professor of physics at UCLA who was not connected with the paper. The discovery is all the more remarkable because Steve’s pioneers did not intend to find a new phenomenon: They just wanted to admire nature. Take Chris Ratzlaff, for instance. Four years ago, he went out one night to watch and photograph the aurora near his home in Calgary, Alberta. Nor did that particular night seem unusual at first. Ratzlaff was entranced by a brilliant display of dancing green ovals far to the north. When the lights lulled, he looked around to admire the stars for a moment. “And there was this streak against the sky,” he told me. “It was pretty dim, it wasn’t very bright, but it was noticeable.” At first, he thought the streak was an airplane contrail: Calgary sits under several passenger-jet routes. But when he pointed his camera at it and took a long-exposure photo, the streak seemed to glow in the image. “It was clear the thing was emanating light, which contrails obviously don’t do,” he said. The next day, back at home, he shared the image with a few other aurora-watching Facebook groups around Canada. Other people had seen the purple streak too, some as early as 2010. (Later, researchers would find descriptions and images of the streak from much earlier, though these had gone unnoticed by the scientific community.) 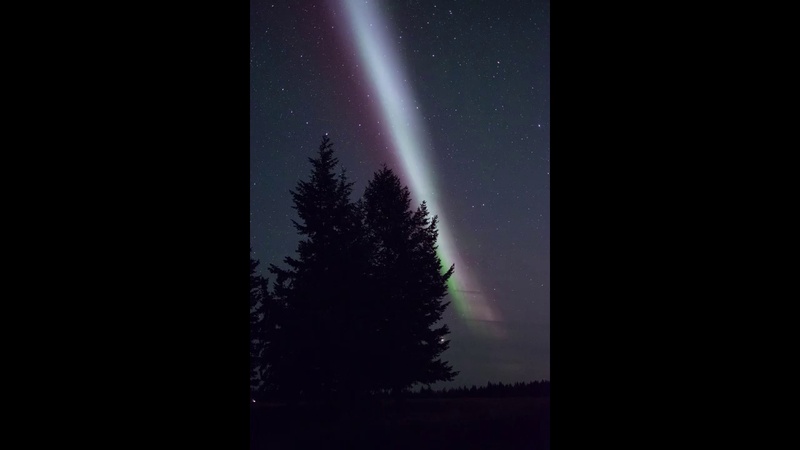 One seasoned sky watcher told Ratzlaff that the streak was called a “proton arc.” Ratzlaff brought this name back to his local Facebook group, and soon photographers around Alberta were capturing images of the “proton arc” of their own. It was not, in fact, a “proton arc”—but Ratzlaff would not learn this for another two years. In the fall of 2014, Elizabeth MacDonald, a physicist at NASA, launched a new online project called Aurorasaurus. She and her colleagues aimed to capture social-media descriptions of the aurora, including geo-tagged photos or videos, in order to help researchers better understand the aurora. The idea came to her when she first searched Twitter during a major aurora storm in 2011. “I saw all these people tweeting about it, and I thought, we have to get these on a map,” she told me. But the project doesn’t just look cool. “All of these citizen-science reports, in aggregate, can be compared to our models of aurora and ground-truth them, to give us a sense of how far south the aurora is extending,” she said. One of the first groups she recruited for the effort was the Alberta Aurora Chasers. Over time, she became a regular in the forum, piping in whenever someone asked a scientific question. (“People love it when someone from NASA comes on,” said Ratzlaff.) Finally, in early 2016, MacDonald traveled to the University of Calgary to deliver an academic symposium. Her dozens of local aurora-watching fans more or less crashed her high-level talk. Afterward, MacDonald and the aurora-watchers—and Eric Donovan, a surprised and suddenly very popular aurora researcher at the University of Calgary—went to a local pub to chat. It was there that Donovan first saw the purple streak. What is that?, he asked, as a member of the Facebook group showed off their photo of a brilliant purple streak in the sky. Donovan corrected him: There was no way it could be a proton arc, as the proton aurora was both invisible and nothing like the image on the screen. The photographer replied that the lavender ribbon had to be a proton arc, because that’s what other people had said it was. Ratzlaff soon got involved, and he confirmed that he, too, had seen the proton arc. Well, whatever it was, Donovan replied, it wasn’t known to science. The physicists and the aurora-watching amateurs in attendance resolved to study it in depth. It would be a perfect project for Aurorasaurus, as well. Very well, said Ratzlaff. Let’s call it Steve. The moniker was useful, too. “In our community, someone could say, ‘Hey, I saw Steve tonight,’ and everyone would know what they meant,” he said. It eventually grew to be more than a placeholder. Last year, Donovan gave a presentation at the European Space Agency titled: “How I Met Steve.” The story went viral, and the name stuck. In the new paper, the phenomenon got its own backronym: the Strong Thermal Emission Velocity Enhancement. But neither amateurs nor researchers use such a highfalutin title in their everyday speech. Just Steve is still fine. The legion of amateurs would eventually prove essential to understanding Steve. In July 2016, social-media users across Alberta glimpsed Steve at the exact moment that a European scientific satellite, SWARM, passed overhead. SWARM studies the Earth’s magnetosphere, the same phenomenon that gives rise to the aurora. This confluence of observations finally let researchers peer into the mysterious heart of Steve. So: What is Steve? Scientists have long known that charged particles in the Earth’s upper atmosphere can form powerful currents, which move as hot, dense rivers through the thin air. From satellite studies, researchers have known that these currents, known as subauroral ion drift, tend to start flowing during major auroral activity. But they also believed the particle streams were invisible to the naked eye. “What the satellite observations reveal is that this very narrow ribbon of light, that’s mostly purple, is associated with a strong flow of charged particles in the upper atmosphere,” said MacDonald, the NASA physicist and an author of the new paper. It’s not the only aspect of Steve that still eludes physicists. Researchers don’t know why Steve sometimes spouts unstable green lights, perpendicular to the purple streak. They don’t even know why the main stream glows purple in the first place. MacDonald said purple is an unusual color for aurora, which usually emit green or pink light. Steve can also be seen from much lower latitudes. In North America, the classical green aurora glows directly above central Alaska or the Northwest Territories in Canada (though it appears so high in the sky that it can be seen from points much farther south). Steve, meanwhile, appears overhead in Calgary and other points in southern Canada. Different physical mechanisms also underlie the classical aurora and Steve. The aurora is caused when charged particles from the sun agitate the powerful magnetic field around Earth. If that field becomes active enough, it can send particles of plasma reeling into the gases of the upper atmosphere, which in turn glow green or pink as they absorb energy. Steve, on the other hand, is caused by electrical charges that course through the upper atmosphere itself. Though even that description may overstate their differences. Scientists know that the strong, upper-atmospheric ion streams are “mirrored” in the Earth’s magnetic field high above. They just don’t know how or why. Because of those physical differences, some researchers say that Steve isn’t an aurora at all, but some new kind of optical phenomenon. Lyons, the UCLA physicist, said Steve “appears not to formally be aurora.” It’s far closer, he said, to a phenomenon called airglow, in which the upper atmosphere releases a faint amount of light as it is heated by the sun and the planet’s surface. “You can see [airglow] all over, but it’s not something you can notice with your eye, and it’s not narrow,” like Steve, he said. “It’s a new type of phenomenon that we haven’t talked about. Formally, it is airglow—but a brand new category of airglow,” he told me. MacDonald sides with calling it an aurora. After all, Steve is a colorful shimmer of light in the sky, triggered by the dance of electromagnetism. Aurorasaurus, meanwhile, has exceeded MacDonald’s wildest dreams. “We imagined learning more about the rare structures of aurora at mid-latitudes, but no, we never imagined finding something like Steve!” she told me in an email. Though maybe there were hints, all along, that much remained to be learned from empowering amateurs to hunt the aurora. In 1958, the solar-terrestrial physicist Sydney Chapman proposed recruiting a worldwide network of amateur aurora watchers, stationed from the hot tropics to the high Arctic. “Those who have the good fortune to observe a tropical aurora may experience the thrill as of: ‘ ... some new watcher of the skies, / When a new planet swims into his ken,’” Chapman wrote that year in Nature, quoting the poet John Keats. MacDonald was not aware of Chapman’s proposal when she created Aurorasaurus, though she cited his paper in Wednesday’s announcement. And no doubt his never-attempted network would have differed from her real one: “In the fifties, of course, we didn’t have smartphones,” she said. In recognition of his contribution, Ratzlaff is included as one of many coauthors in the paper announcing Steve. So too is Notanee Bourassa, an amateur photographer who captured the time-lapse video on July 26, 2016, that let MacDonald and her colleagues track down Steve in the SWARM data. Lyons, the UCLA physicist, agreed. “It is truly exciting, to us as aurora scientists, that there is a group of amateurs out there who enjoy the aurora so much that they could put together something that is this new to us. That’s just unbelievably cool,” he said. Steve has now achieved worldwide fame. While the aurora borealis, the Northern Lights, may be the best-known version of the phenomenon, the aurora also appears in the southern hemisphere as the aurora australis. Steve has likewise popped up down south. He was recently spotted by sky watchers in New Zealand. But Steve hasn’t left his old haunts. On Friday night, Ratzlaff stood huddled with his camera, at a popular spot for aurora-watching near Calgary called “Twisty Road Pond.” As the aurora lulled, he looked around—and there, faintly, at the top of his sky, was Steve.